There is just something so universally appealing about SpongeBob. It is one of those shows that I feel adults and kids can watch together. I often watch Spongebob with my kids and I have seen more than a few gags that went over my kids heads. Take for instance the sentence enhancers episode if you have not seen this episode go check it out now as it is hilarious. Anyway SpongeBob has starred in a few really surprisingly good 3D platform games over the years and he has had some success on the iPad as well. This time SpongeBob is in a game like Simpsons Tapped Out or Skylanders Lost Islands. Ok let’s start with the good. 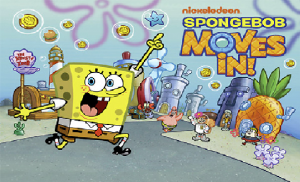 SpongeBob Moves In looks great. They have managed to capture the look and feel of the show very well. Bikini Bottom has a very fun style and that is very well represented here. Most of your favourite characters from the show like Patrick and Mr Krabs will be here as well as locations such as The Krusty Krab and SpongeBob’s Pineapple house. I am sure that in the coming weeks more and more stuff will be added to the game. As well as the game looking great there is also some really cool sound bites in here as well. The game also has some really cool animated scenes that showcase some of the different characters and they do kind of want you to get more people to your town in the hope that you get a new video. So this is a great looking game I really have zero complaints in terms of the games presentation. Now the game play. If you have played any of the games like Simpsons Tapped Out, Skylanders Lost Islands or whatever then you will know what to expect. The idea of the game is that you need to build a town full of your favourite SpongeBob characters. But the “fun” does not stop there as you will need to make sure they are fed and get them to do other stuff as well. Like the other mentioned games the events in the game are timed and when you set a character off to do something you have to wait in real time for them to finish. This is not an issue exclusive to this game as it is in pretty much every other game that follows this formula. My main gripe with this game is that it is clearly aimed at kids. As much as I love SpongeBob I know that as a 31 year old guy I am not Nickelodeons core audience. All the other games in particularly Simpsons Tapped Out will let you play the game without spending a dime up to a point, but to get some of the cool stuff you have to spend some money. SpongeBob Moves In so far is the worst offender of this I have come across. To start with the game is not free its four bucks to me for four bucks there should be far more content that you unlock in the game. Or at the every least the in game items should be cheaper than they are. The thing that really bugs me is that you can spend upwards of fifty bucks on in game currency and still not have enough to get everything the game has to offer. Again this is not an issue that is exclusive with SpongeBob Moves In. But for me if I spend over fifty bucks on a game I better be able to see every little thing that the game has to offer. For the love of god if you do download this for your kids make sure your in app purchases are turned off or else you can expect a pretty hefty credit card bill at the end of the month. To me SpongeBob Moves In offers nothing new and the fact that it is not even a free download makes this a game I in no way can recommend. If you are a diehard SpongeBob fan then I am sure you will download it anyway, but just be warned you will have to spend some money to see all the game has. Hello I was wondering if there’s a way to restart spongbob moves in so I can play over again!